I hate keys. They get lost, freeze up, fall on the ground, take up space in my pocket, and scratch things like my smartphone. And, now that my car has keyless entry and ignition, I even get annoyed at cars that require me to dig in my pocket and take out the keys. Such a hassle. 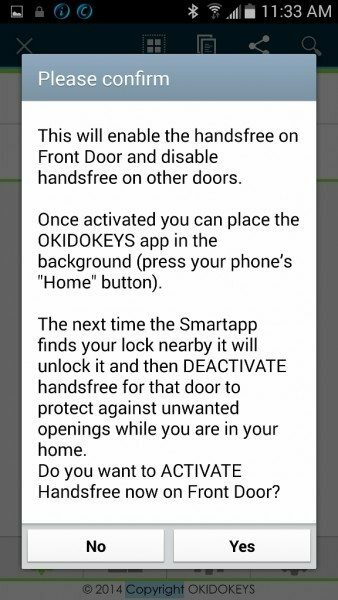 Okay, I don’t feel waves of sympathy coming my way, but nevertheless I was very excited to learn more about the OKIDOKEYS Smart-Lock that promises to eliminate my front door key, the last one in my pocket. The marketing promise is: “Your smartphone becomes your keys!” That’s a gadget that I just had to try! OKIDOKEYS sent me two boxes. 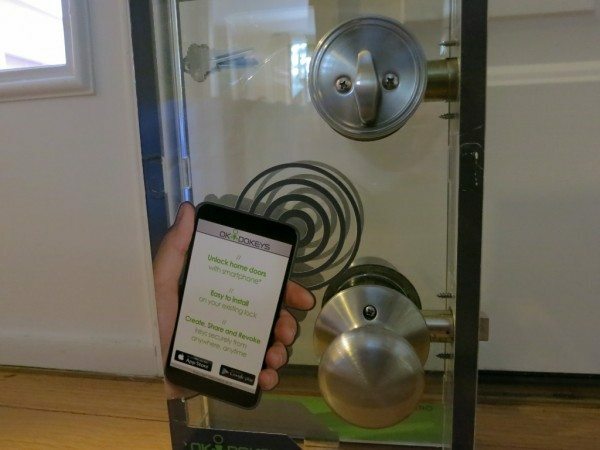 One is the “Smartphone Operated Smart-Lock.” It basically replaces your inside deadbolt handle – this product is only for doors locked with deadbolts – with a battery-operated mechanism that can be activated using a Bluetooth 4.0-enabled smartphone. 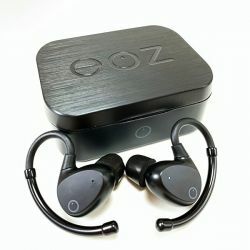 The second box contained a Smart-Reader, which extends the options for communicating with the lock to include Near Field Communication (NFC, Radio Frequency identification (RFID), and Crypto-Acoustic Credential (CAC) signals. With the Smart-Reader installed outside and next to the front door, a variety of additional devices can operate the door, including authorized cell phones and key-chain/wristband/wallet tags. 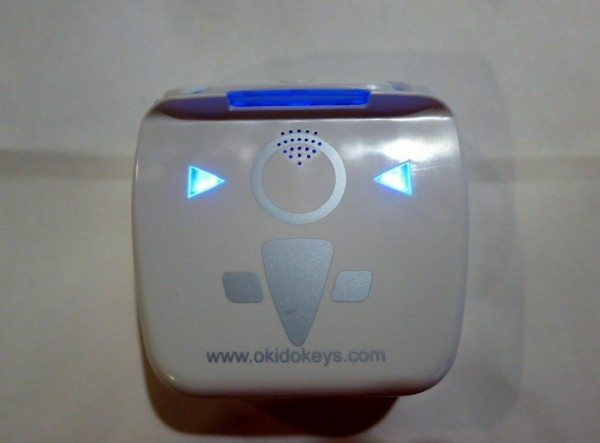 Devices and authorized users can be programmed to grant limited time access to babysitters, housekeepers or contractors, all remotely using the OKIDOKEYS website. The product literature promises easy installation and simple operation. 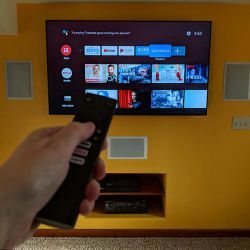 For the owner wielding a Bluetooth 4.0 smartphone, there’s even a mode that’s hands-free and unlocks the door automatically when you get close to it. No fumbling for the key with two hands full of grocery bags! Sounds great – let’s check it out. So far, so good. No additional batteries or tools are required. Installation is a 12-step process that should take less than half an hour, even for someone trying to remember to take notes and pictures. Then the inside, where the top deadbolt handle is what will be replaced. 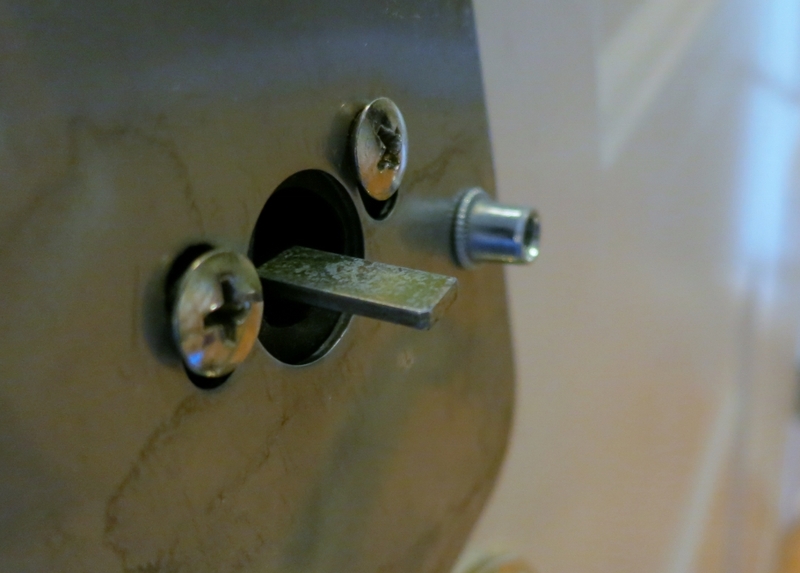 …and screw the Smart-Lock onto the metal plate. Uh-oh! My Smart-Lock didn’t mate up with the metal plate. It wouldn’t push up against the door. After some double-checking of the instructions and my work, I gave in and called OKIDOKEYS tech support. I found out that only most deadbolt locks are supported, and my particular Schlage lock apparently has a longer spindle than most and is an exception. In the picture below, you can see the long, flat spindle that is blocking the Smart-Lock from reaching the door. OKIDOKEYS says that this is a known problem with certain Schlage locks and they are engineering a solution, but don’t have one available yet. Bummer! On the positive side, the person I talked to was exceptionally friendly and knowledgeable. When he found out that I was doing a review, he even offered to send me a “demo door” with a lock that I could use to test the product. 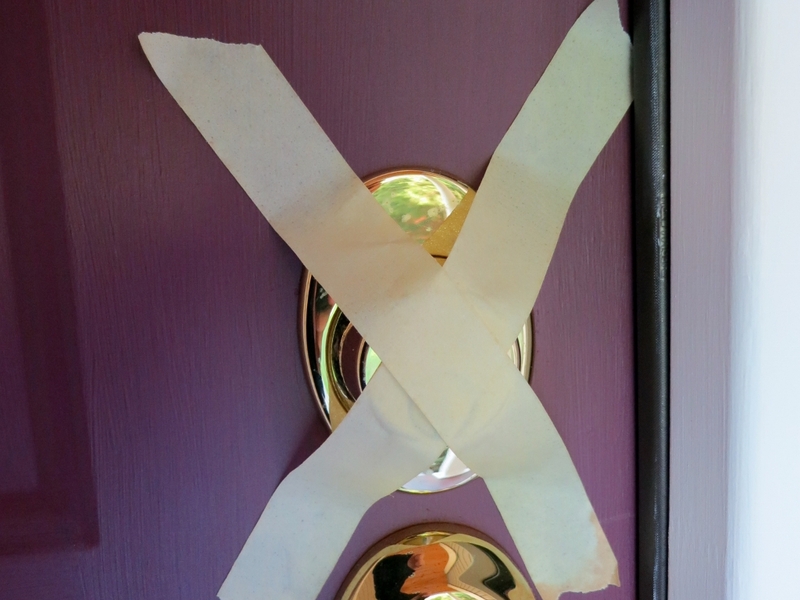 Biting back my disappointment at not being able to do a real-world test – at least not without replacing the lock on my door – I agreed. 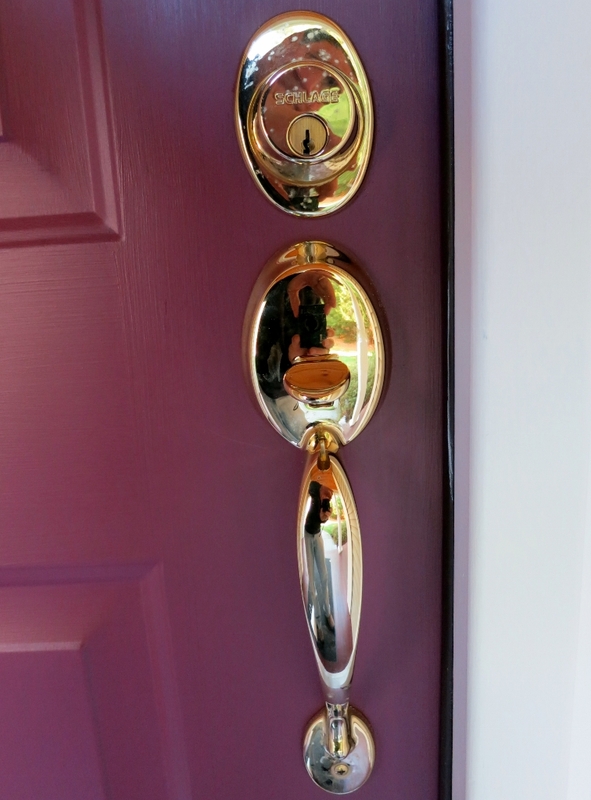 A few days later, I received an acrylic door section with a door handle and deadbolt installed. This time, as expected, the hardware was compatible with the Smart-Lock and I got all the hardware assembled, with one exception. 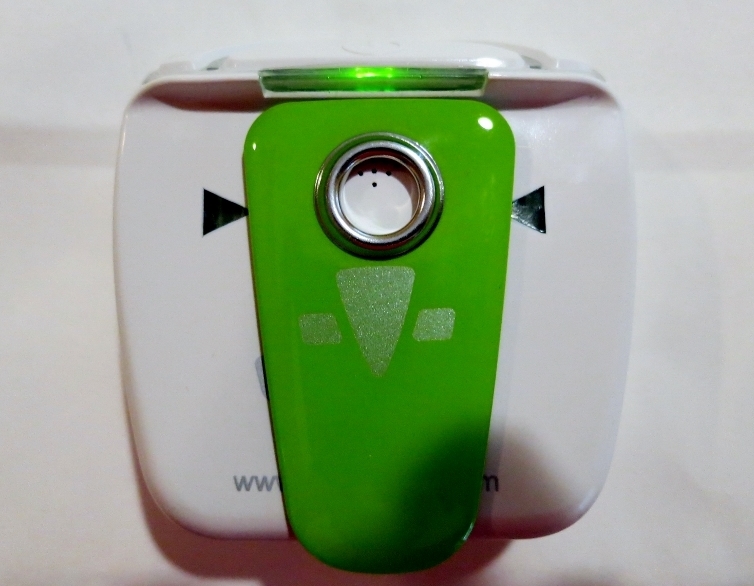 The uninstalled item from the Smart-Lock box was the magnetic sensor. This is an optional two-piece kit. 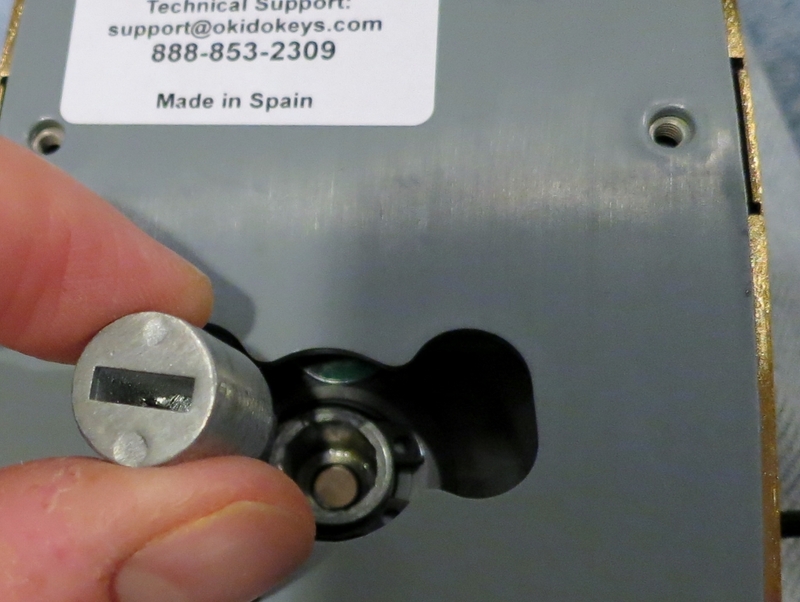 The pronged piece plugs into the Smart-Lock and the blocky piece has adhesive on the back to stick to the doorjamb – it must be within 0.6” of its mate when the door is closed. The sensor allows the Smart-Lock to detect whether the door is open or closed. 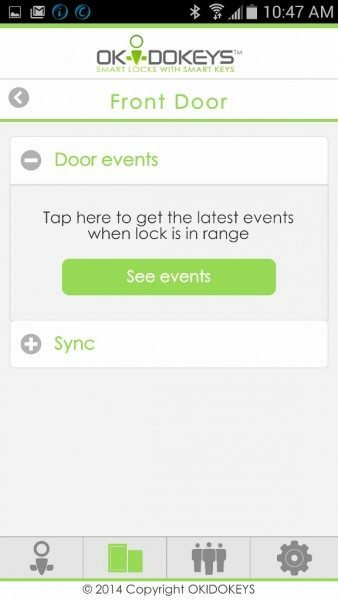 This enables additional functionality such as sending an alarm when the door is open or – very exciting for me! – auto-relock of the closed door in hands-free mode. So you can leave your key (i.e. smartphone) in your pocket and the door will unlock on approach and then relock when you walk away – nice. Unfortunately, I was testing without a real door and no doorjamb at all, so I left the sensor kit in the box and followed the instructions to launch the Smart-Lock “auto-learning process.” This involves a repetitive process of pressing the test button and watching the Smart-Lock figure out a) which direction the spindle must turn to lock the door, and b) how far the spindle should turn to lock the door all the way. It takes a little while. I almost gave up at one point and called tech support because the deadbolt was only engaging about a quarter of an inch and the promised “green light” for success failed to flash on the Smart-Lock. 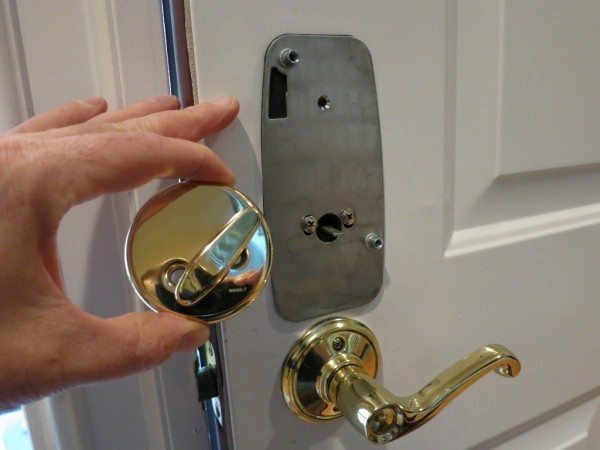 I finally provided some manual assistance to twist the dial just enough to where the Smart-Lock seemed to overcome the sticking point and extend the deadbolt fully. Hooray! I should note here that the mechanism is a little noisy, somewhat like a struggling electric screwdriver, which may bother you. Anyway, with the hardware installation complete, I put the cover on and could now operate the deadbolt in three ways: the external key, the inside dial at the bottom of the Smart-Lock, or the triangular button above the dial. The next step is to register the Smart-Lock. There is some fine print on the instructions sheet telling you that, if you purchased a Smart-Reader, to install it before going through the registration process. So I’ll open that up next, even though I have no place to actually install it. 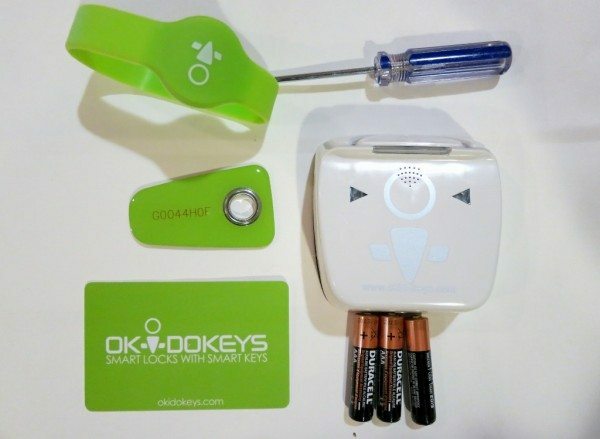 The Smart-Reader box includes the white Smart-Reader, three AAA batteries, a T-10 (Torx) screwdriver, and three flavors of Smart-Tags: wallet card, keychain, and wristband. The Smart-Reader is white, and is about 3” x 3” square, and 1 ¼” deep. It has an adhesive backing to mount outside near the front door – it must be located within ten feet of the Smart-Lock. The Smart-Reader is an optional addition priced at $99 standalone or $60 when purchased with the Smart-Lock. 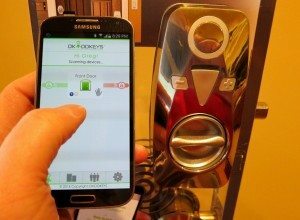 It enables access to the Smart-Lock by all mobile phones (not just Bluetooth 4.0 smartphones) and the OKIDOKEYS Smart-Tags. While much less convenient than a smartphone – and perhaps not even as convenient as a key – these means of access offer some advantages. You can provide keys to friends or contractors on a temporary basis, enabling them for just a few days or even specific days and times. 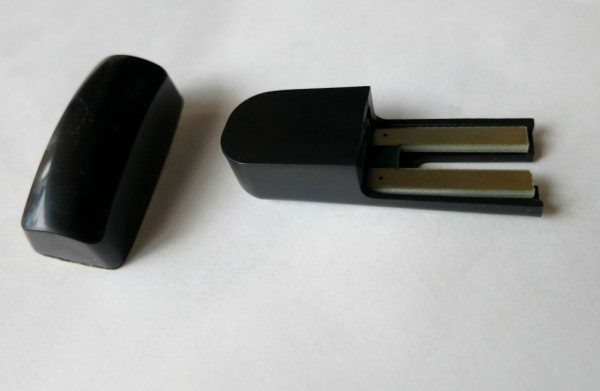 The wristband Smart-Tag might be especially useful for children who otherwise tend to lose keys – larger children, though, because the wristband did fit my adult wrist. 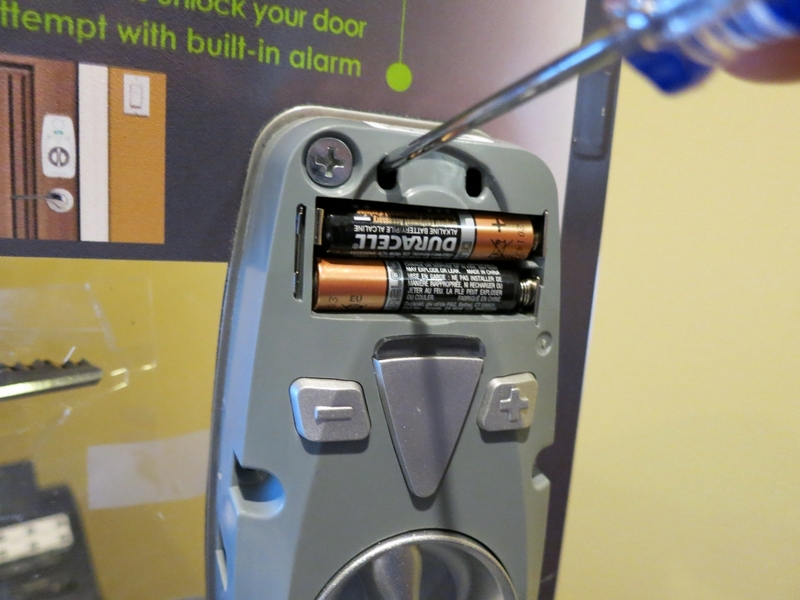 I followed the simple instructions to insert the batteries in the Smart-Reader, placed it on a desk within ten feet of my pretend door with Smart-Lock, and was finally ready to register my devices and try them out! Happily, registration is clear and straightforward. First, you register each Smart-Lock, Smart-Reader, and Smart-Tag with a serial number printed on each one. Each Smart-Lock is assigned to a door name that you provide – I named mine Front Door even though I was only using the fake door on my desk. Then, you identify users which are allowed access and assign them to the means of access they will use. These include the Smart-Key App (iOS or Android) for smartphones, Smart-Key for any mobile phone, or one of the Smart-Tags. 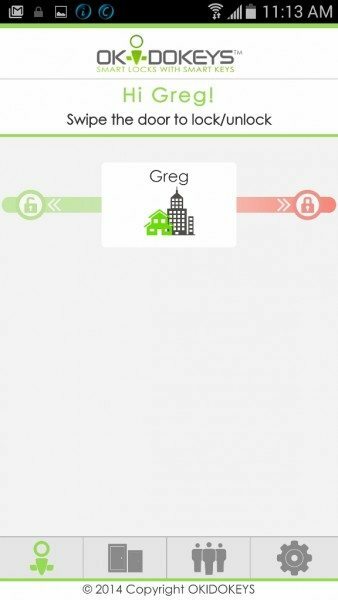 After that, drag and drop each user – you can assign photos to each user for easier identification – to the door to which they’ll be allowed access. When you do that, you’ll see the dialog box below. Here is where you can assign complete access to the door or temporary access. There is a note stating that the feature to specify a time-slot per day for a user is “coming soon.” This gives you lots of flexibility in managing user access. It took three attempts to sync successfully, but then I was ready to play! 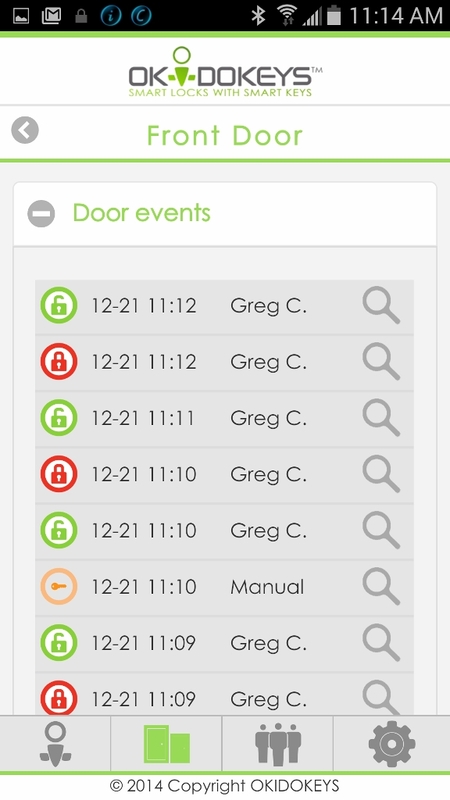 The first thing I did was use my smartphone to open and close the deadbolt, simply a matter of sliding the icon on the primary app display to the right or left. Of course, I said yes. Then I walked back to the Smart-Lock, stood in front and, after a couple of seconds, the motor ground and the lock opened. The next time it opened before I even got in the room, so maybe just the first time took longer. I had to experiment with this a bit. I found that the app did have to be in the background, not active, for handsfree to work. It makes sense, because otherwise I couldn’t have used the app to lock the door without it automatically unlocking. For handsfree to be really useful, I would need to have the magnetic door sensor operational so that I could enable automatic re-lock when leaving. Even then, I’d want to try this on my actual front door for a while and decide if I could live with hearing the lock motor grind every time I passed within Bluetooth range of the front door. So the verdict isn’t clear on handsfree mode, but I had other things to explore. 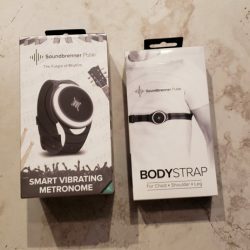 I checked out the Smart-Tags. 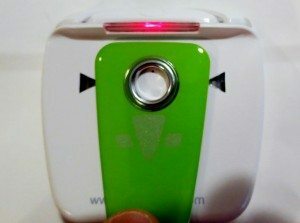 To operate them, you need to push a button on top of the Smart-Reader, which initiates some flashing blue lights, then hold the tag up to the Smart-Reader. You’ll hear the motor, and the light on the Smart-Reader will indicate whether you’ve just opened the lock (green) or closed it (red). It’s pretty straightforward, but you would definitely want to demonstrate the procedure to the person to whom you give a Smart-Tag. 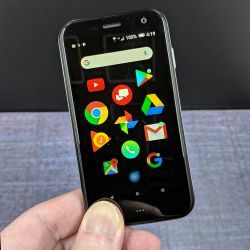 It gets trickier if you are trying to use a phone without Bluetooth 4.0. You can download the same OKIDOKEYS app and use that. Here is what my own phone looks like with Bluetooth turned off. 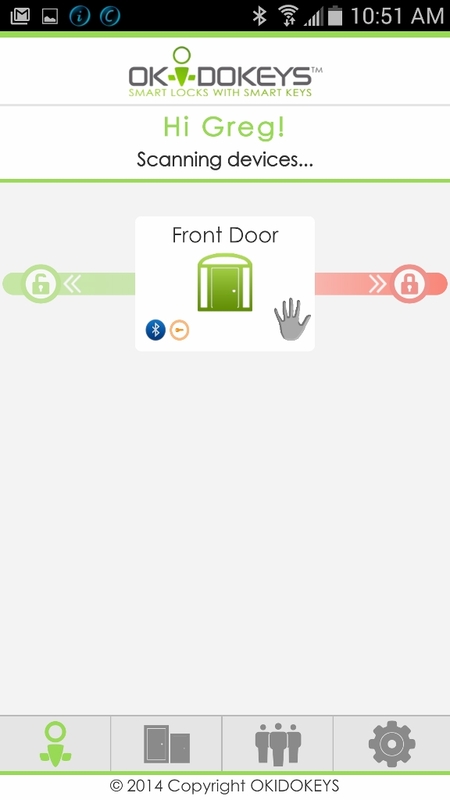 The phone can’t “see” the Smart-Lock, so there is no Front Door icon. Instead, you walk up to the Smart-Reader, activate the blue lights, and swipe the icon on the app. A static-y tone begins, and you hold the earpiece (top face) of the phone to the Smart-Reader. 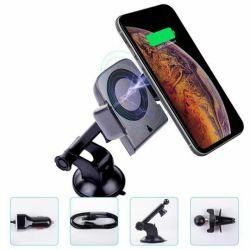 You have to make sure that you hold the correct part of the phone up to the right location before either device times out, which can take a little practice. It works, but it’s not as convenient as a Smart-Tag or a key. It’s even worse if you don’t have the app. I registered Emilie (my wife) as a smartphone user without the app. She promptly got a text message (which concerned her because I hadn’t warned her about what I was doing) with a toll-free number and a PIN. To open the door, you have to dial the number and follow the prompts to enter your PIN and either a 1 to lock the door or 3 to generate the tone to lock/unlock the door. The message says not to use the speakerphone, which adds to the juggling act of hitting the phone keys at the right time, activating the Smart-Reader, and providing the signal from the phone. If you hit any key wrong, the call is terminated and you must start over. You don’t have to necessarily listen to the whole recorded message, but it’s very easy to go too fast and terminate the call. I was probably successful on two attempts out of a dozen or so. 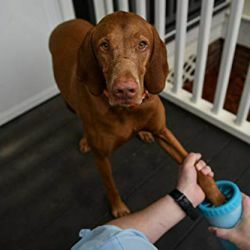 This is something I’d only attempt if I were far away, desperately needed someone to get in the house, and had a patient family member or neighbor that I could walk through the process. Still, it beats breaking a window, which might be the only alternative in some situations without a Smart-Lock. 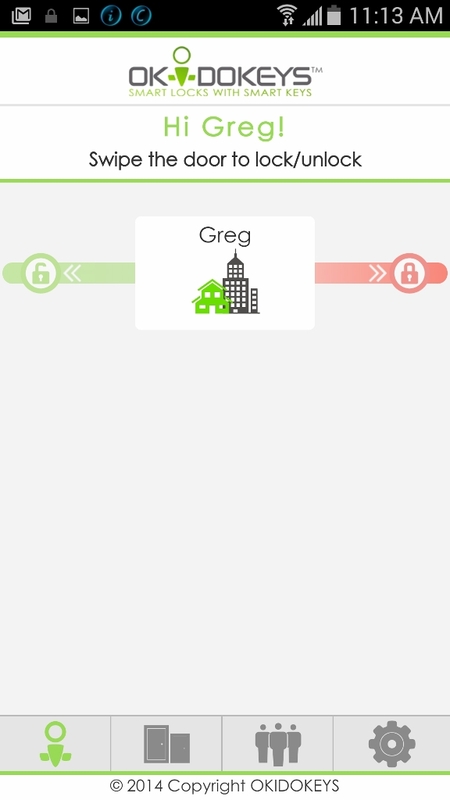 A nice feature is the ability to view “Door Events” to see a log of people entering and leaving. The detailed view of each log entry lets you know which device was used to open the Smart-Lock. I have a couple of concerns and observations after a day of testing. First of all, my smartphone battery was unexpectedly low in the evening when I tried to make a call. 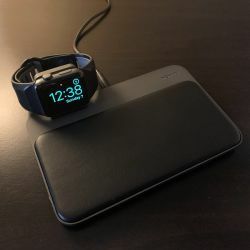 My unsubstantiated guess is that all the Bluetooth activity, perhaps especially the device seeking in handsfree mode, drained the battery faster than usual. I can’t verify this, but it’s something to think about if you already have trouble getting through the day on a charge. 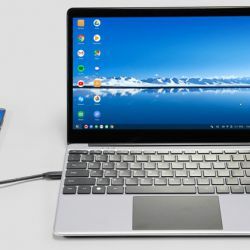 Second, although the initial registration and setup happened on my PC browser, I found that managing users and devices was easier using the Android app (and presumably holds true as with the iOS version). For example, I wanted to change the access interval for one of the test users that I set up. This wasn’t possible on the website, but I could do this under “Manage Access” for the user in the app. So don’t expect the functionality in both places to be identical. 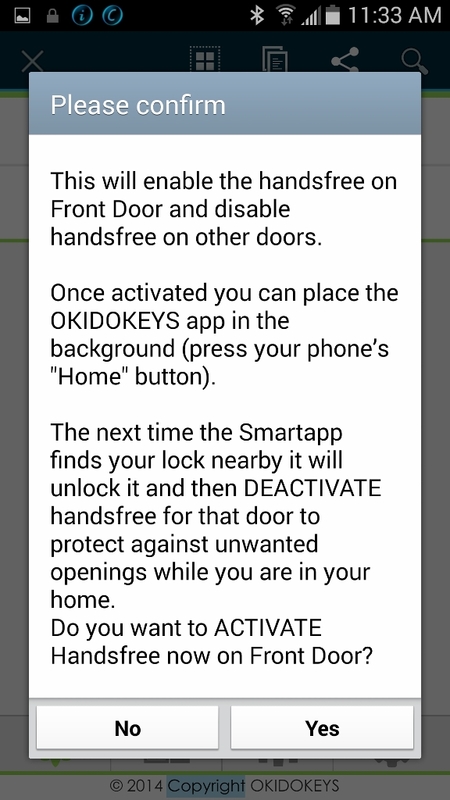 In the end, I have mixed feelings about the OKIDOKEYS Smart-Lock, dominated by the fact that I can’t use it because it’s incompatible with my lock. If it weren’t for that and the rather noisy operating mechanism, I’d call this a well-designed product. Most functionality has been carefully determined. 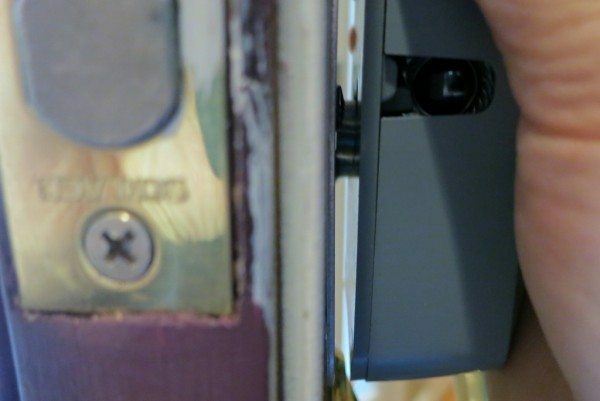 Thoughtful touches include a child/renter mode which disables the ability operate the deadbolt with the push-button on the inside of the lock. It basically returns the deadbolt to the manual mode that will be more familiar to casual users. The portal website tries hard to get me to implement a double-key security access and most security features seem conservatively safe (including the maddening disconnect after a single error in telephone access mode). 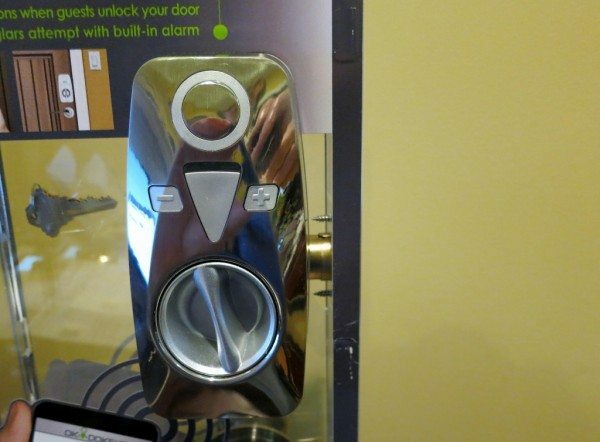 My final reservation comes from Emilie’s observation that the Smart-Lock is “big and ugly.” As a Gadgeteer, I just thought it was cool, but it certainly adds a sizable chunk of metallic plastic on the inside of your door, so do run it by the discriminating member of your household before making a purchase. 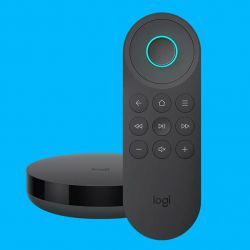 I would only recommend the Smart-Lock to primary users with Bluetooth 4.0 phones, because other access methods are fairly cumbersome. I also would hesitate to recommend this if the deadbolt isn’t on your primary entryway. I generally enter through the garage, much less often through my front door. Hence, even if it worked for me, this would be an expensive option for occasional use. Still, it would get rid of that pesky last key that I carry around! 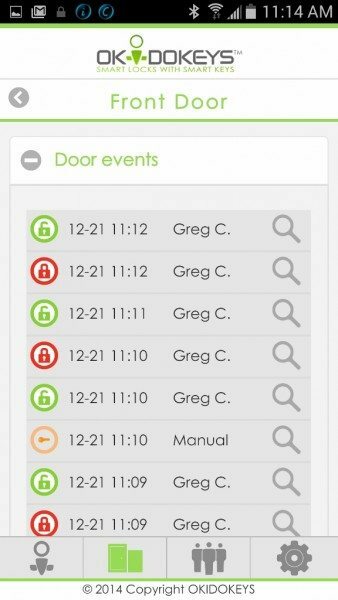 I can picture Smart-Lock being a great product for the apartment or townhouse dweller who often gets caught with both arms full of groceries, wondering how the heck to get the keys out to unlock the door without breaking the eggs. 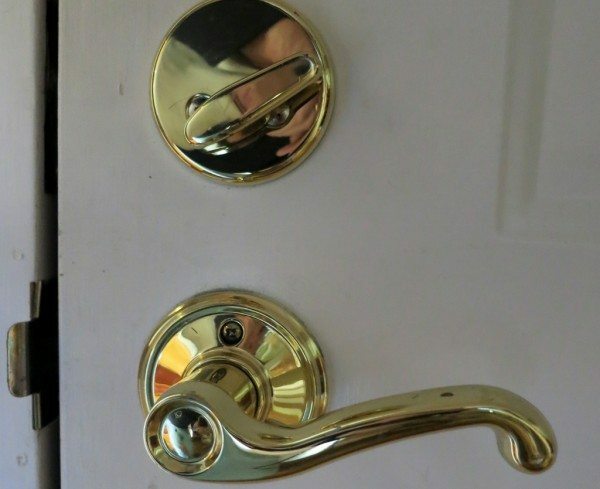 Being able to walk up to a door that automatically unlocks would be the next best thing to having a doorman or a butler actually open the door! The OKIDOKEYS Smart-Lock ranks high on the “cool gadget scale.” Hopefully, this review will help you determine if it’s the right gadget for you. Just make sure you keep the receipt in case it’s not compatible with your deadbolt! 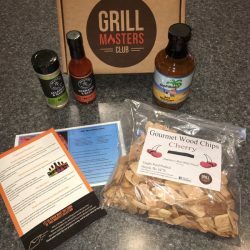 Source: The samples for this review were provided by OKIDOKEYS. 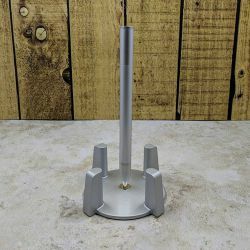 Please visit their site for more info about this product. Considering what you had to go through, it sounds like a bad solution looking for a problem. If you do not want to carry a key, have you checked out a keypad lock. 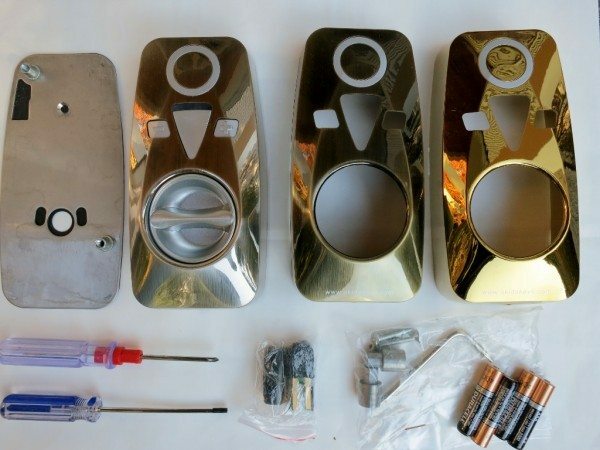 You could even buy a biometric lock that would be easier to install. @Donald, One thing that I liked was not having to change out the existing lock, including changing the external appearance. I still think this could be a good solution for some people, but not for everyone. However, your suggestions on the keypad or biometric locks are worth considering. I do have keypad access to the garage doors, and that is the primary way of getting into the house if I’m not using the car remotes. While I like new and innovative gadgets I still prefer to leave my house key in a keypad lock. I agree with Donald about keypad locks. I installed 2 from Kwikset for less than $100 a piece. The batteries last a year, and there is a normal mechanical key for back up. The keypad itself is small and attractive. Installation took less than 30 minutes by someone who is somewhat handy. I have had these keypad locks for 3 years now, and they are fabulous and fool proof. I replaced my standard deadbolt keyed entry about 4yrs ago with a number pad entry and I will never go back. 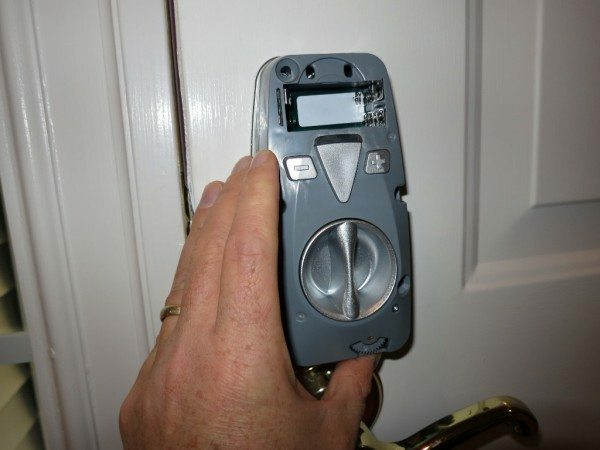 I don’t need my smartphone, my kids don’t need a key that they always loose, I installed it myself in about 30 minutes, I bought it from Lowes, I have to replace the batteries about once a year. Based on all these comments, I may have to consider a keypad lock for the advantages you have described. I am still drawn to the premise of the smart lock, however, for its ability to provide controlled temporary access and, especially, hands free locking and unlocking. I am also considering a keypad lock for my house and garage. A fingerprint lock (NextBolt) is a great option if you have different people coming and going. 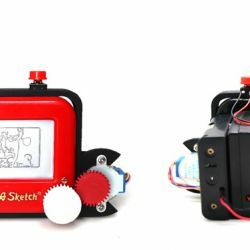 Ours can handle 99 different prints, is easy to update, and works pretty well. The only down side is you have to take your gloves off in the Winter!!!! I have two of these at my house. Installation was very straightforward. I had the same problems with the initial sync. I agree with everything that the reviewer wrote about the products. My biggest complaint is that they still have not shipped the internet gateway that I originally purchased in October. They are still trying to work the bugs out. So, at this point, the only way for me to grant access is to sync via Bluetooth to the locks. 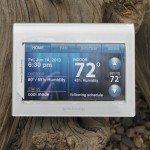 I am also anxious to see what the Smartthings integration could look like. Integration with IFTTT would be nice too. All of that hinges on the gateway being available.